There are some weekends that stand out from the rest, and this weekend was one of them. Fall is in full swing in Charlottesville, and things in MADville are getting crazier by the day. A full social, sweat, and food recap of the weekend is in order, but I need to take a day or two to get myself in order and honestly just recover from what feels like a week of constantly being on the go. While this week is another over-full week of work and life (in a good way), the most exciting for me is a client-driven restart on the food front. 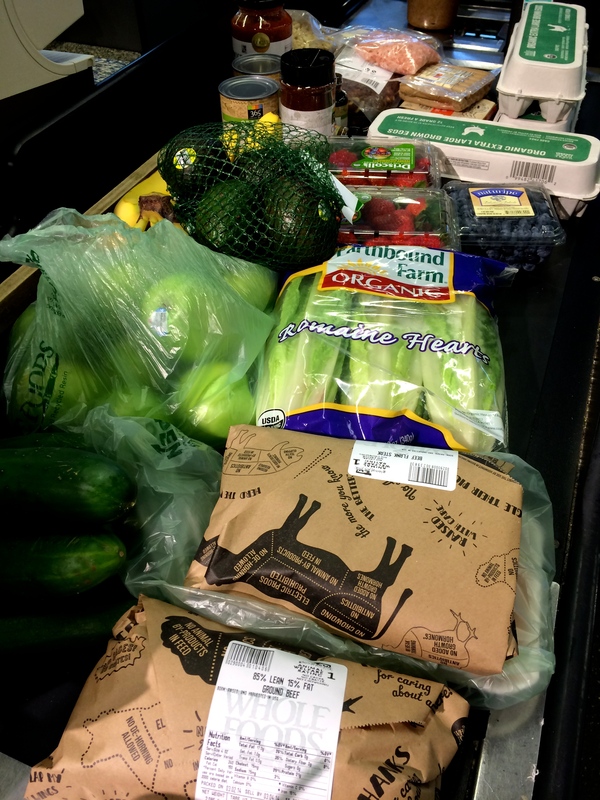 Some of our clients signed themselves up for the Whole 30 challenge from Whole 9 and are starting tomorrow. Hearing this was awesome not just because I have a group to motivate and recipe share with me, but also because it’s such a huge part of the lifestyle and health change we continue to love seeing slowly take over this community. Since I was out for most of the weekend and didn’t have a kitchen at my disposal to prep meals, I’m a little behind, but I’ve committed to getting my life together tomorrow to walk (or eat, really) side by side with this group as they start this 30 day push. That being said, here are a few of my favorite / must-have ingredients, recipes, and just generally amazing food to lead off week 1. This isn’t totally exhaustive, but for the most part every recipe that I make that is an ‘everyday’ recipe includes these ingredients. 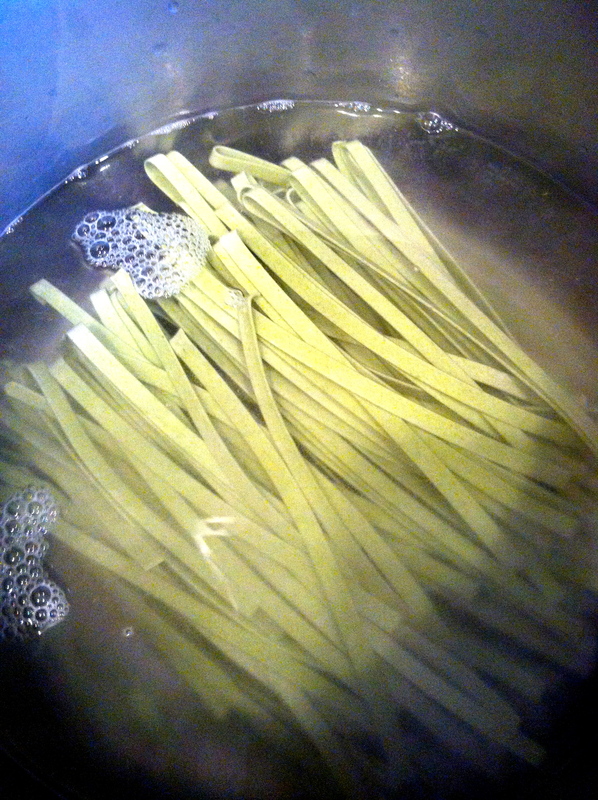 Every once in a while I’ll really branch out, but only if I’m making a new/special recipe. These staple items will still be stocked in the fridge. The MOST important part of staying sane during the first week or two as you quit sugar and adapt back to real food is to HAVE food available. This is not a starvation diet — you NEED to eat, so make sure you have good clean food available and prepped to keep your energy up and balanced. 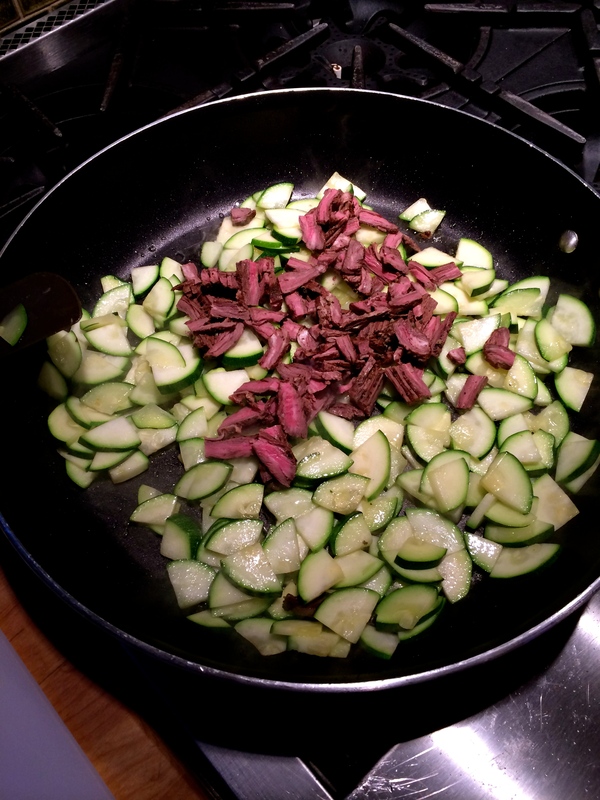 The easiest thing to do is to make a big dinner on Sunday night (or any night really) with several sides and spend some extra time chopping things up (like zucchini or celery, etc) to have ready for cooking or snacks. I’ll usually roast a spaghetti squash or two on Sunday while I have time so it’s ready in the fridge for quick meal assembly since my week nights (and days) are usually much tighter on time. Here are a few favorite meals that can all be made with the food on the grocery list above, and save amazingly well (read: amazing leftovers and quick grab-and-go options). 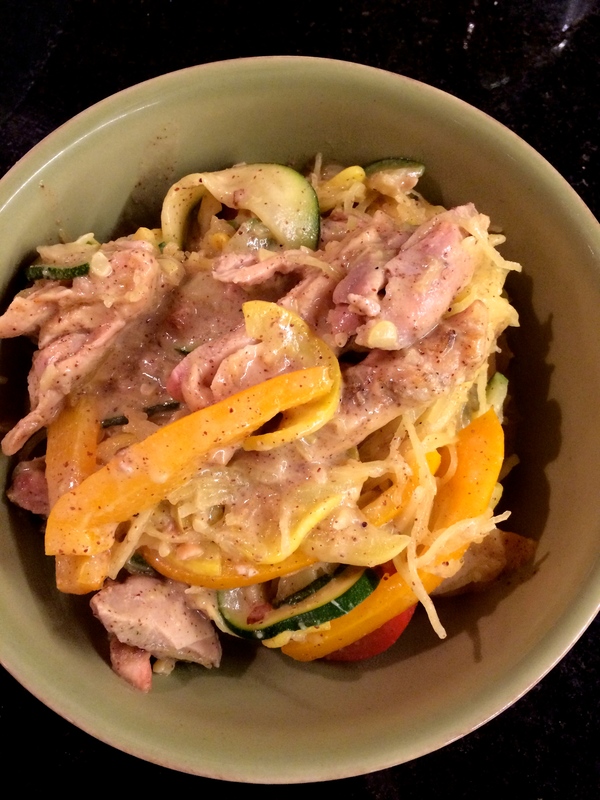 [Lunch / Dinner] Thai Chicken Stir-Fry is probably my favorite rainy-day or winter meal, but it’s still awesome in the summer with cauliflower rice OR over spaghetti squash. There are no exact measurements, but the feedback we’ve come up with is that adding a little more coconut milk for a thinner sauce is better than a really thick one. 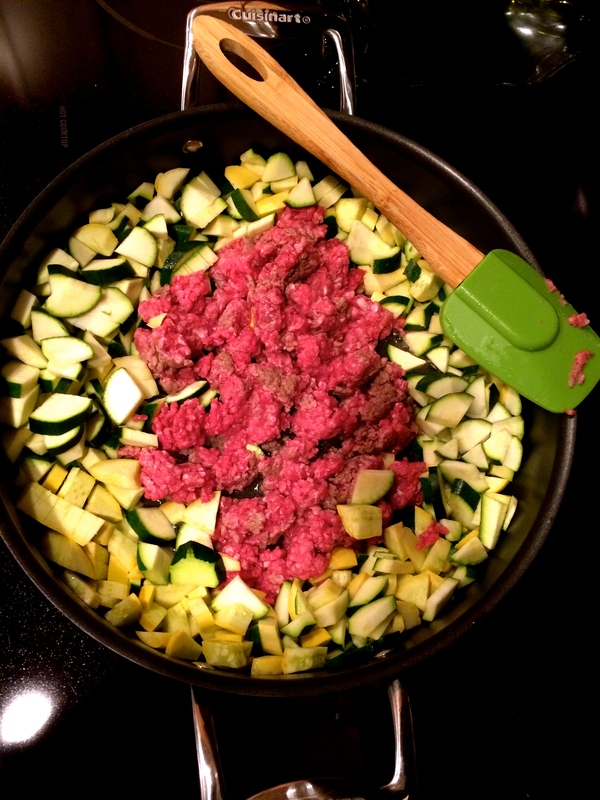 [Lunch / Dinner] Spaghetti Squash Bolognese. 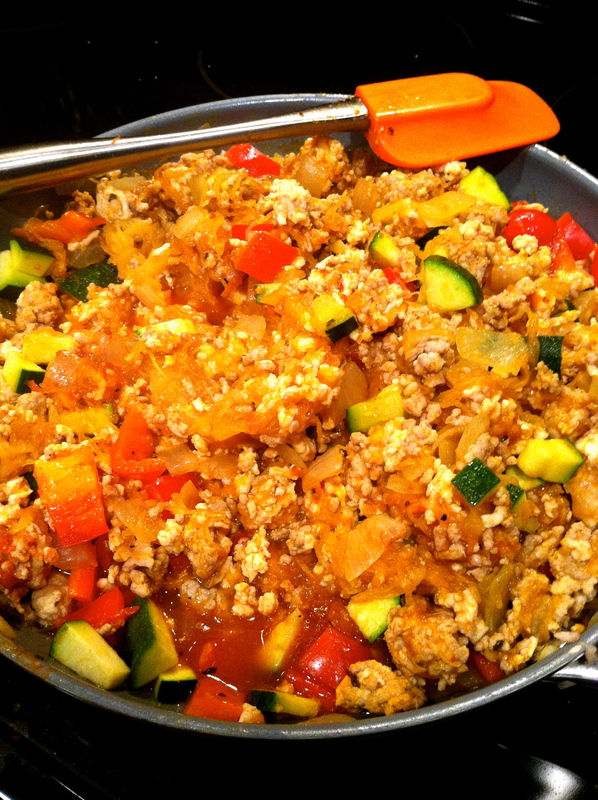 It keeps AMAZINGLY well as leftovers, so this is a great one to make in excess and pack up for lunches during the week. 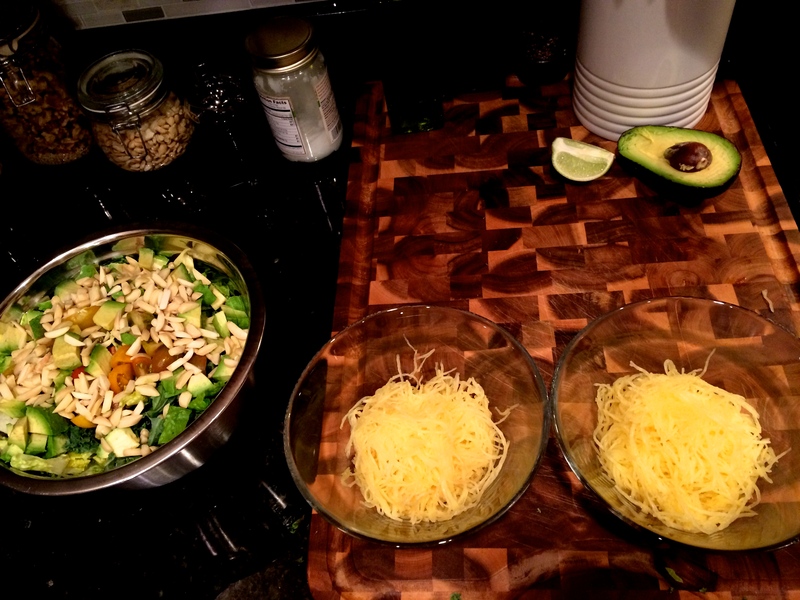 So, to our Whole 30 first-timers getting ready to give up all of their ‘favorite foods’ tomorrow…. congratulations, you’re about to know what it feels like to be fueled with the best stuff on earth – REAL food. It will change your life. For other general ideas, search salads, vitamix (for smoothies) or dinner, or check out the eats or fuel categories on the blog. I live for Sundays. 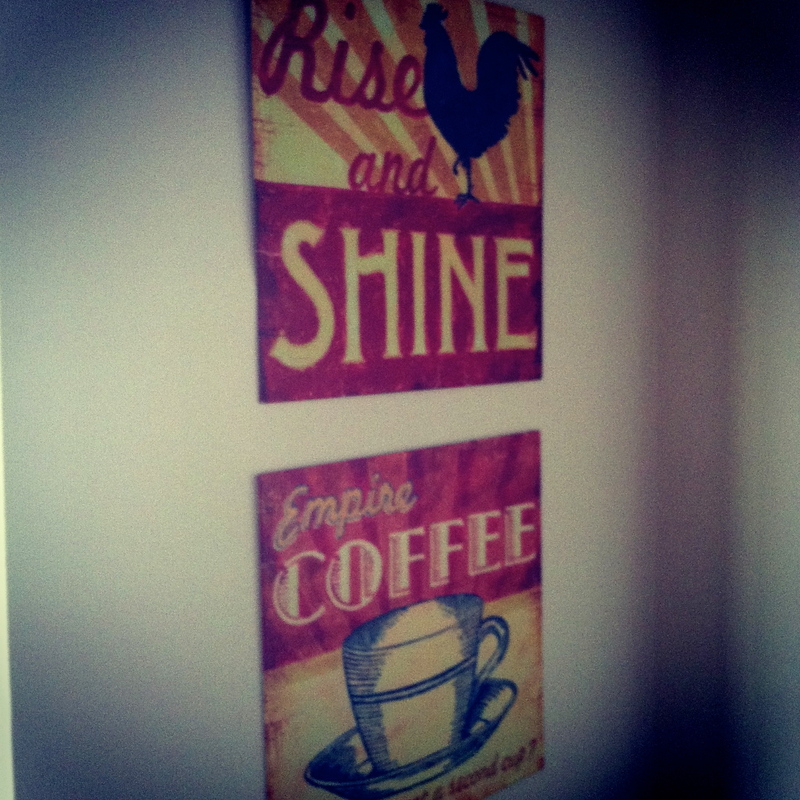 It’s the sleep-in, make breakfast, drink my whole damn coffee (or two), and enjoy the scenery day I exist for. Even when I’m in Charlottesville (especially when I’m here) and I know I’m going to be at MADabolic in the morning, the pace is still distinctly different. The only thing better than Sunday mornings are Sunday afternoons that involve great food and relaxation. Since this past Sunday marked day #2 of the 28toLife partial re-charge, and thanks to an afternoon trip to Whole Foods, the fridge was stocked with food begging to be turned into something amazing. Now, I’m going to digress for a moment because this Sunday happened to also bring the less than thrilling news that apparently it was going to snow — again. I love a good snow day, maybe once a year, but that quota was filled months ago and I’m ready for 70 and sunny. Apparently that wasn’t happening, so after surviving the parking wars at Whole Foods and a desperate scramble for provisions, it was homeward bound for 48 exciting hours of wine-less confinement. The best way to keep my mind off of something displeasurable is to cook, so I blocked out the snow-cast and got organized. The fridge was inspected by Bug, and packed with plenty of food to survive the storm (note: the left side door doesn’t count– some things should never be thrown away even if they’re forbidden in the moment #beer #wine). 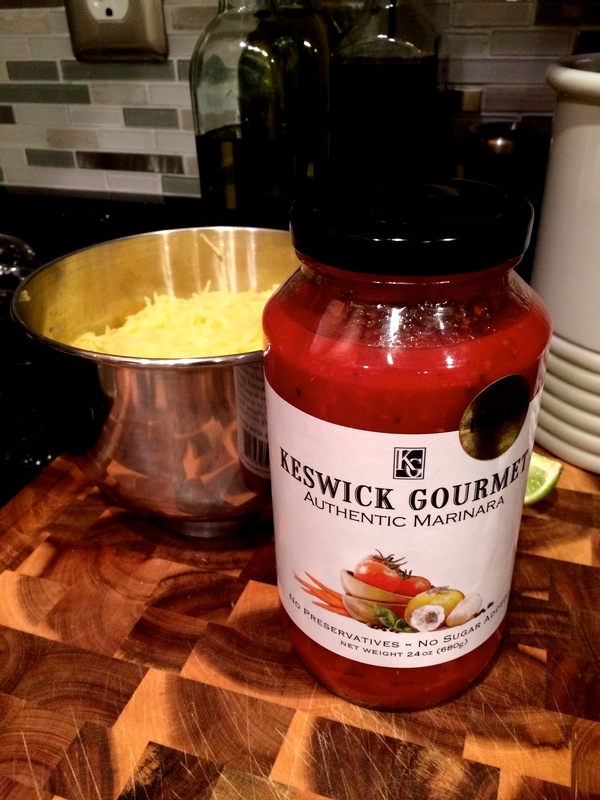 For dinner, I started with two main ingredients: spaghetti squash and my new absolute favorite (and LOCAL) marinara from Keswick Gormet. The woman who actually makes this sauce happened to be in Whole Foods on Sunday with a sample table. It is completely free of preservatives, sugars, or any added anything outside of her amazing natural ingredients — and it tastes JUST like my grandmother’s best sauce (a true testament from an Italian granddaughter). Since I needed to get some meat into the meal, I decided to make a vegetable and ground beef base to transform it into a meat sauce. 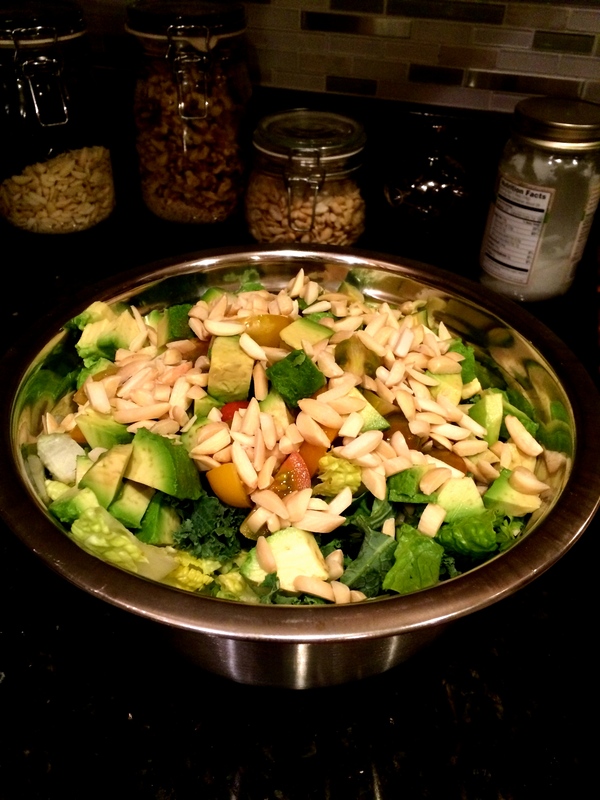 While it was all simmering together a salad was created with romaine, kale, avocado, almonds, heirloom cherry tomatoes and cucumber. I love food, pretty non-discriminantly, but this was SO good. 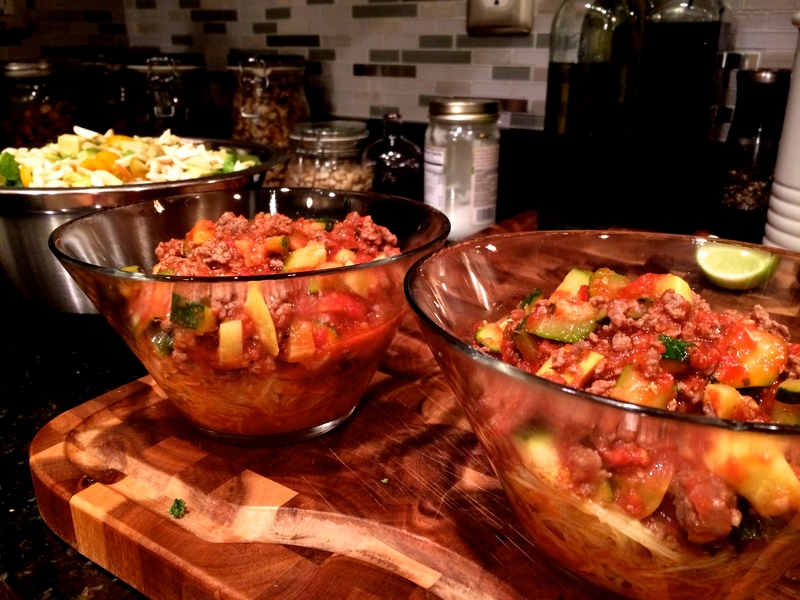 I had roasted two spaghetti squash the night before, and the full jar of marinara with a little over a pound of meat so there was plenty to go around, and a good amount of leftovers (that all lasted less than 24 hours). 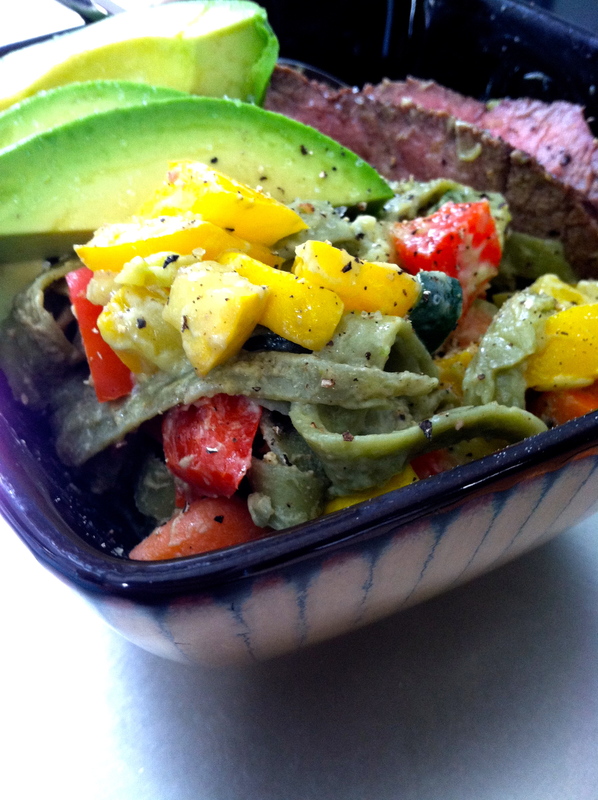 I highly recommend this as one of the easiest, best, and most re-heating friendly meals ever. Try it. So, the moral of the story is that I survived the snow, and managed to keep myself busy long enough to avoid any serious breakdowns — although wine would have helped my morale tremendously. 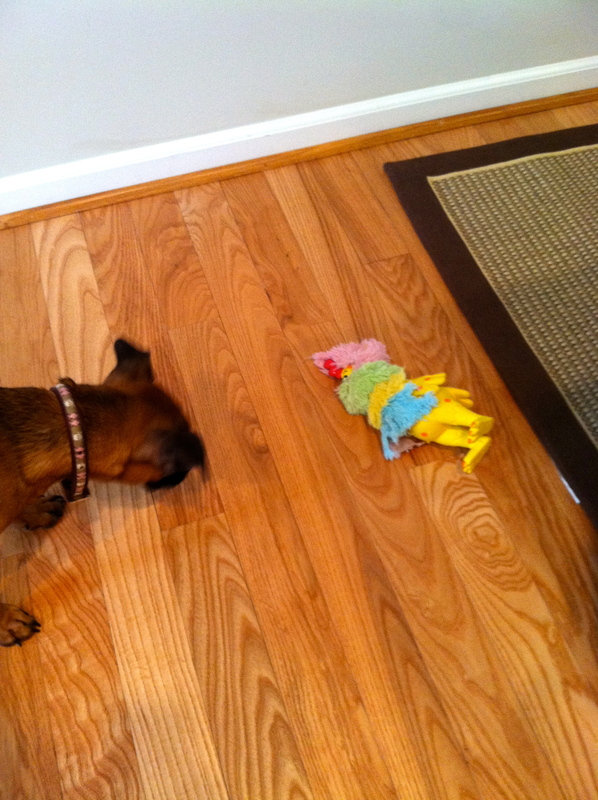 Even with the bonus hour of sleep (which I took FULL advantage of), Monday came as abruptly as ever. And with the lowest temperatures of the fall, which is really only going to contribute to my discontent. I’m definitely a coffee-only morning person, and will consider food a few hours later once my body has had a chance to wake up. 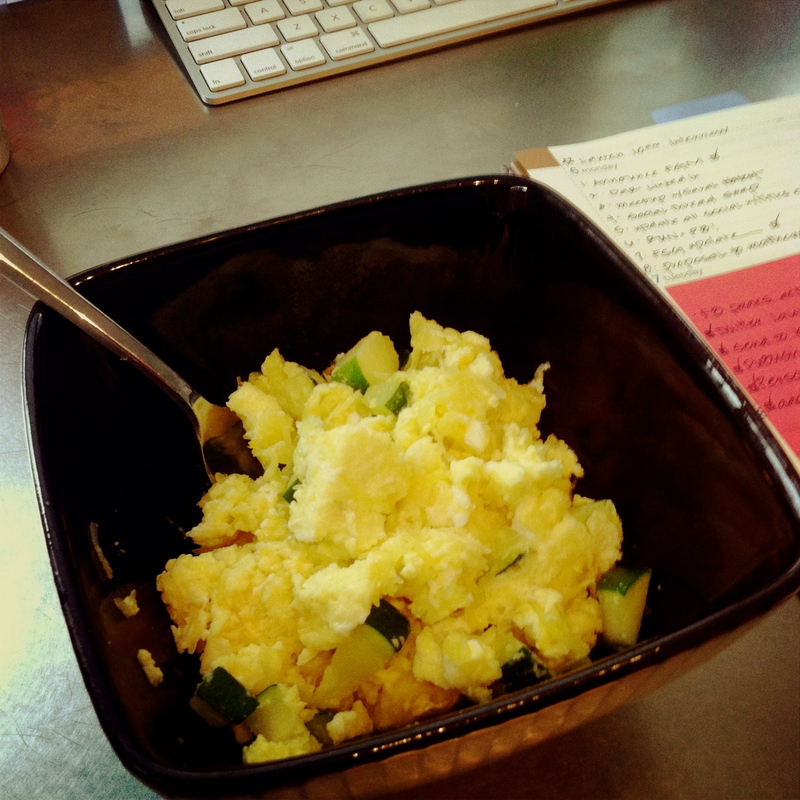 This morning I was definitely on the slow and steady path, starting with iced coffee first thing, and followed up with a vegetable, steak, and egg scramble late-morning to keep me going. I started hoarding collecting iced coffee tumblers from Whole Foods a few months ago, not only because proves economical for me ($4 refills! ), but also because I don’t have the time or energy to coordinate a coffee run every morning. Having their amazing iced Toddy mixture just an arms length away, in my own fridge, feels like winning each and every morning. 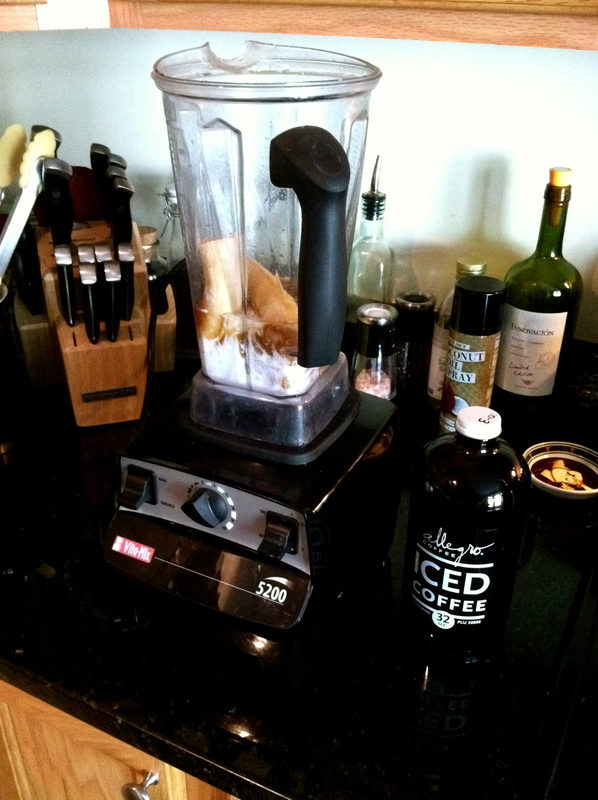 So, with a tumbler in hand, and vitamix plugged in, I make my own version of a Frozen Monkey. Today was a long day of work, and since I took class at MADabolic the last three days in a row, I decided upon a well deserved rest day. I’ve been trying to be better, recently, about really enjoying my rest days and fully listening to my body when it needs a break. So that’s what I did. What does an afternoon of rest look like, you wonder? It looks like this (and it feels awesome). 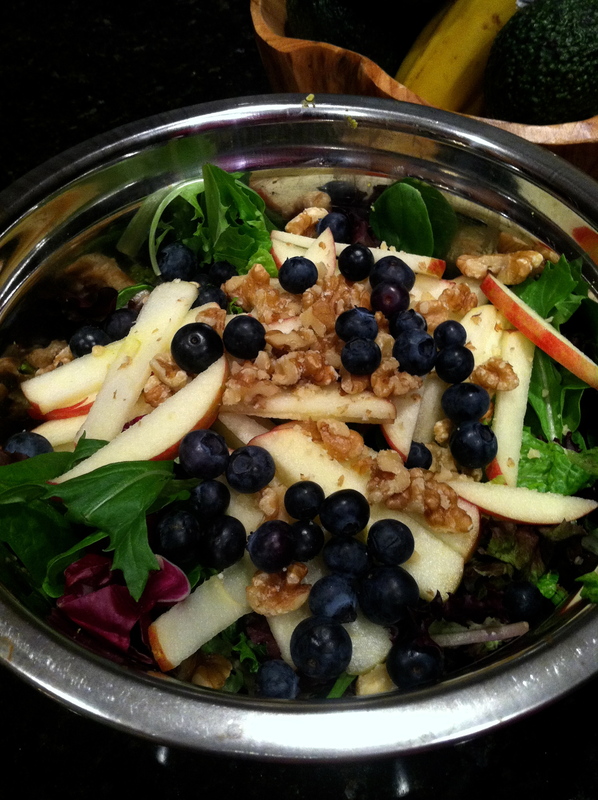 Mixed greens, chopped walnuts, a honey crisp apple, and blueberries, made for a pretty awesome fall salad. 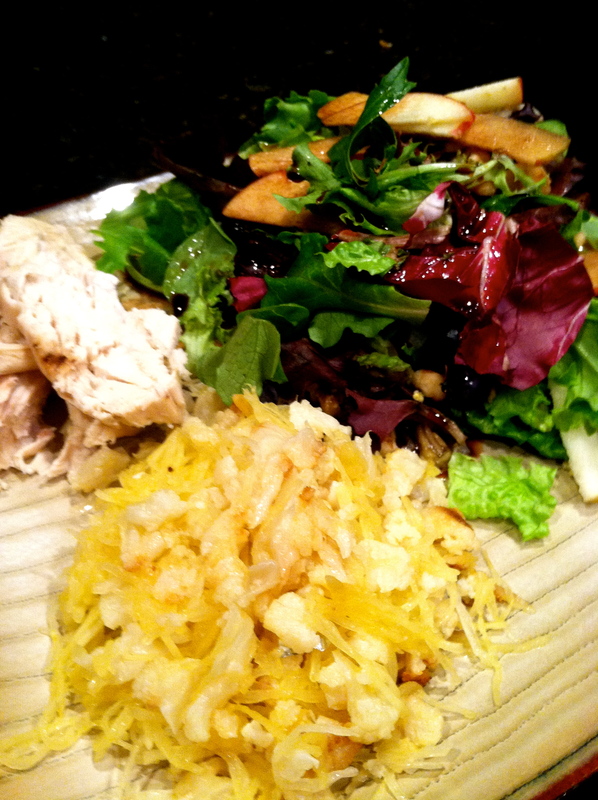 And since no salad is complete without some protein and side items, this particular meal was rounded out with a mixture of Sunday night’s leftovers: roasted chicken, and spaghetti squash sautéed with roasted cauliflower. Lets be honest, if it’s going to get dark before 6pm, the least you can do to cope is have a great meal ready and waiting. And this one was exactly the right blend of not-too-heavy combined with the warm comfort that comes with cold weather food. Welcome November, I was not looking forward to you, but so far, so good. The excitement from yesterday’s announcement is still lingering, but thankfully reality has also set back in because we have a ton going on and it’s time to get back to work! In addition to all of the Fight Gone MAD developments, FemCity Charlottesville is moving into the spring with some pretty awesome spring and summer programming that we could not be more excited for. The next event is coming up on Thursday, May 30th, and is the kick-off to our Locavore Fem Dinner Series all highlighting local Fem business owners, FemCity members, and inspiring entrepreneurs, as well as local farm to table fare. Space is limited to each dinner, so register ASAP to reserve your spot! This is an amazing opportunity to connect with other amazing Charlottesville Fem’s in a small group, sharing your business or professional goals, asking for feedback or connections, and hearing about the amazing projects that everyone else is working on as well. Share, collaborate, connect, that’s the idea. We’ll be sharing some really exciting, big, events that we’ve got planned for the summer and early fall that you don’t want to miss. They’re going to be great, and we look forward to a ton of great engagement from Fems and Fem businesses! In other news, while today was definitely a busy one, I got a head start early this morning on returning emails, checking off my to-do list, and was able to easy into the day. I had coffee first thing, but after the pizza and cider celebrations last night I wasn’t ready for food until about 9:30. 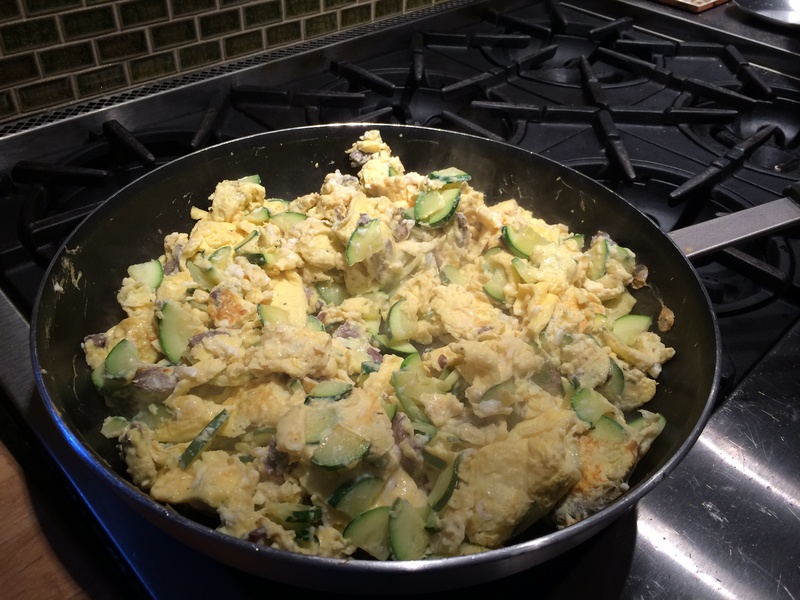 Breakfast was spaghetti squash, zucchini and eggs scrambled together. I never would have assumed it, but the spaghetti squash really adds something to the eggs, more of a texture than a flavor, that I love. After I ate and had a few minutes to wrap up some ‘office’ work, I managed to convince my mind, and body, that I should do Dar’s 10:30am small group session. I was actually really glad that I did, and in the moment believed that I was done for the day, but alas, I ended up doing the workout a second time with the 5:30pm bootcamp group. I’ll let you all know if I’m able to walk tomorrow. Each station was 1 minute of work, with 30 seconds off, for three continuous rounds. After the 5:30 class my body was demanding dinner so I tried to put to use what was left in the fridge. 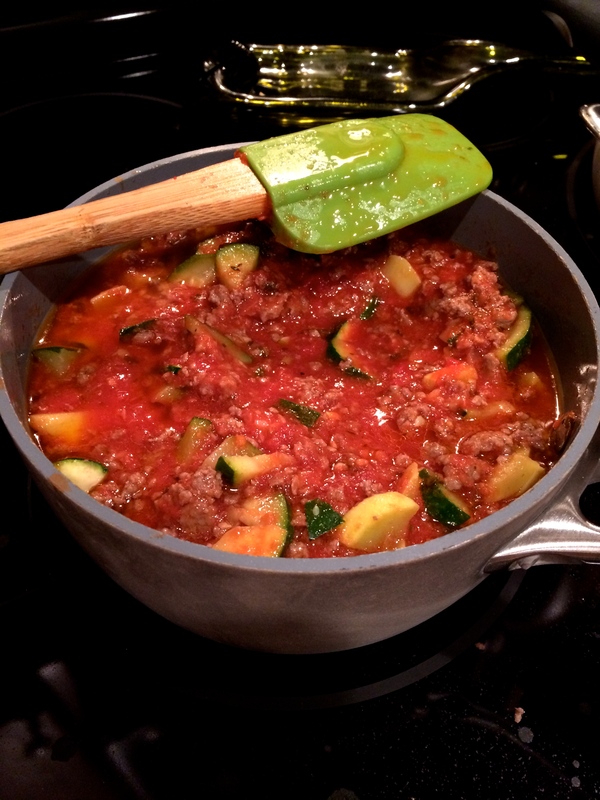 I had spaghetti squash, ground turkey, a zucchini, a red pepper, an onion and the 365 brand pasta sauce (no added sugars!) that all went on the stove. It was all seasoned with kosher sea salt and my favorite everyday seasoning from Trader Joe’s, of course. 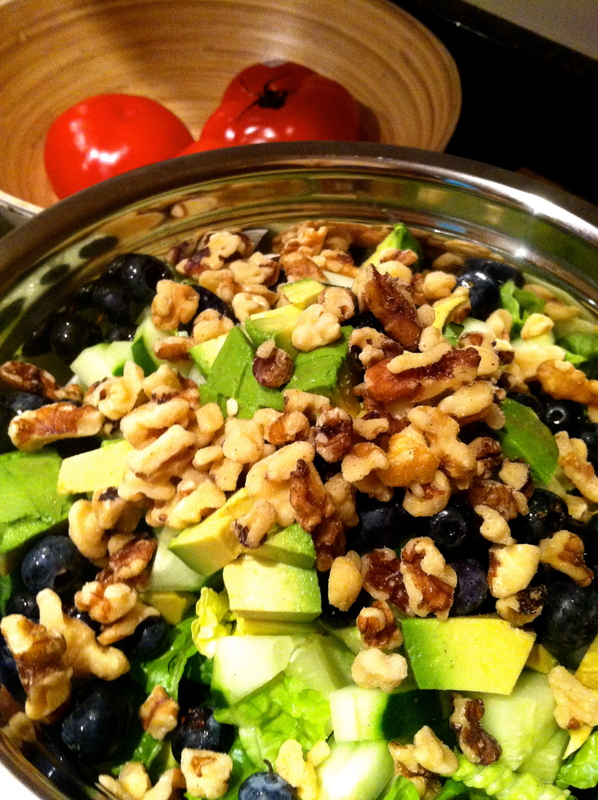 For the salad I had romaine, blueberries, avocado, walnuts, and cucumber. Pretty simple, but a great mix of flavors and colors. 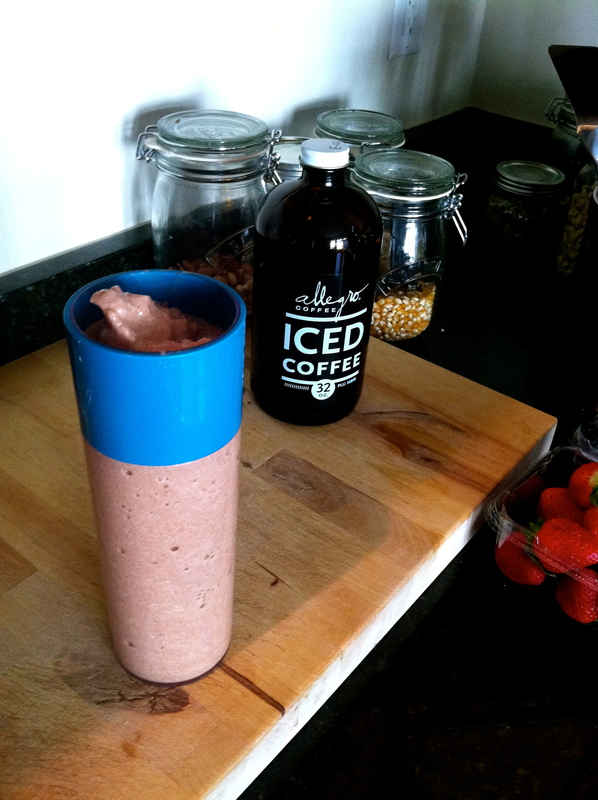 It was a great blend of different (random) ingredients, and definitely replenished everything that I needed following today’s double workouts and hours at the computer and running around the house trying to get re-organized. Tomorrow is another day of bootcamps starting bright and early at 6:15 am, so I’m going to take my own most common advice and get some sleep so I’m not totally dragging. The only bonus to all of the rain is that it really helps me sleep, so I’ll embrace it and just appreciate my sleep rather than being beside myself about missing the sunshine. Fingers crossed that we really do get to 70 degrees tomorrow! I have a habit of grabbing coffee at Whole Foods when I go in to buy groceries, but somehow despite my frequent drop ins I had perpetually missed some very important facts that they have posted on the wall. 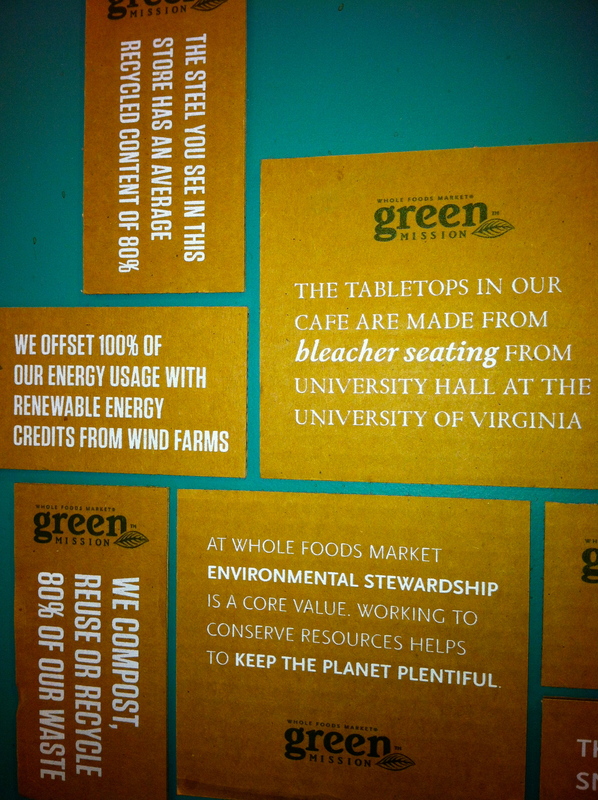 I love Whole Foods for their foundation work, and knew that they were leaders in renewable energy and upcycling materials, but they actually used the bleacher seating from UHall (the old University of Virginia basketball arena) for their cafe table tops? That’s awesome. 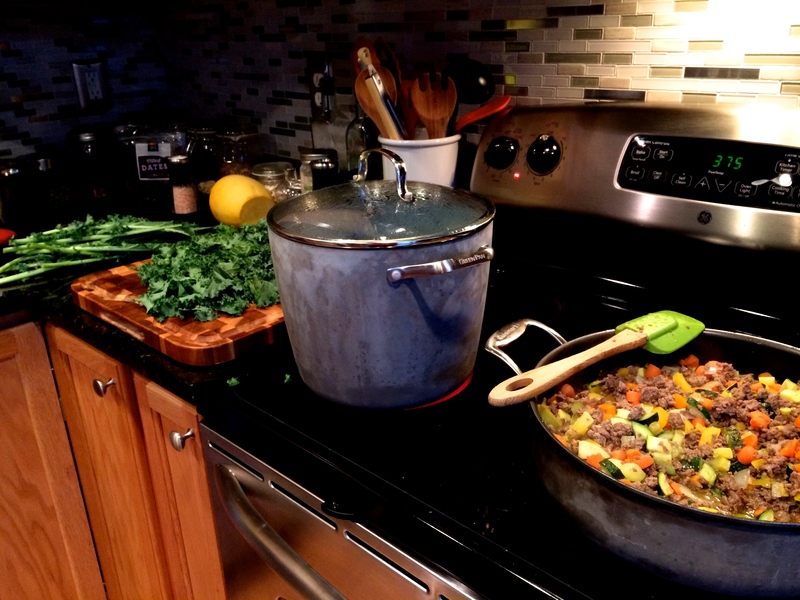 This method of recyling (and upcycling, if you will) was a serious inspiration for helping to minimize my time spent cooking this week, and maximize the meals created. 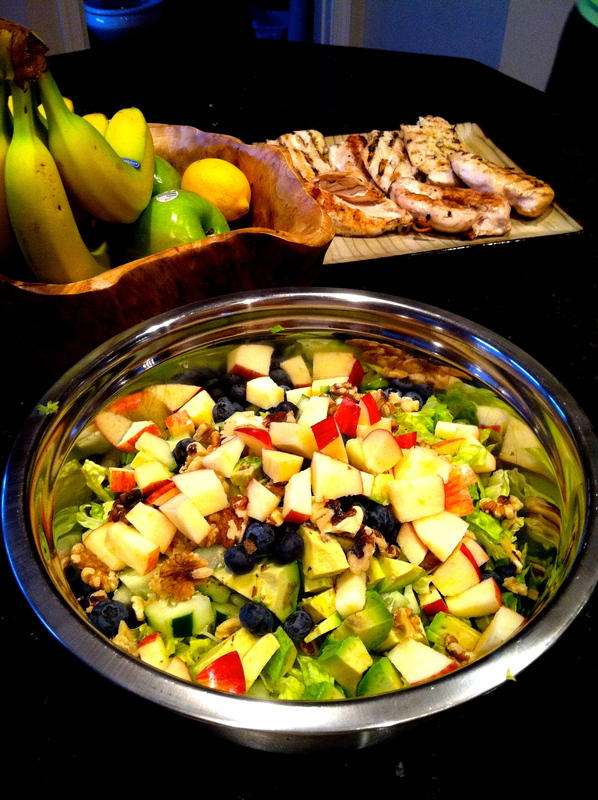 I was craving two of Ralph (my dad)’s old clutch meals, tweaked to be clean and balanced fuel meals. 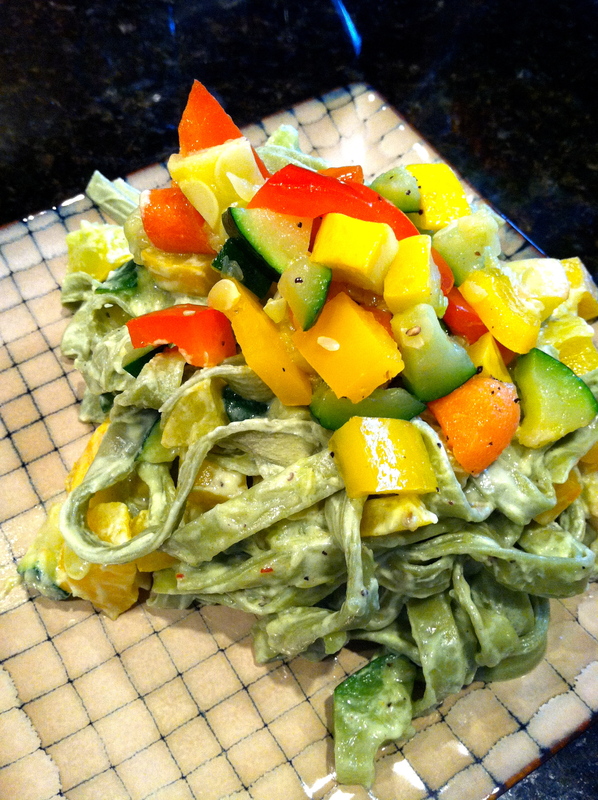 The first half of the inspiration was a meal I replicated a few months back with (gluten free) spinach fettuccine, an avocado/greek yogurt blend dressing and veggies. The other half was inspired by his pasta primavera, my childhood favorite which was always rich with vegetables and popping color. 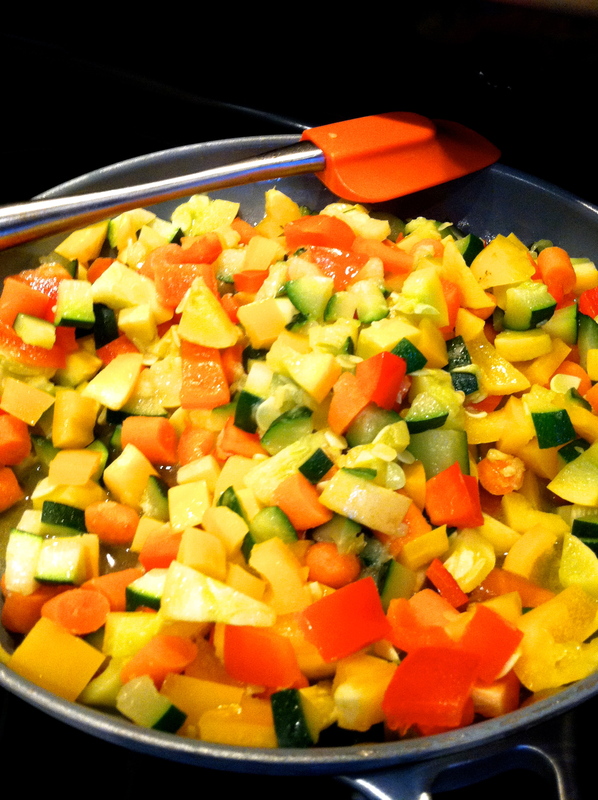 The base of this meal was a mix of sautéd zucchini, yellow squash, carrots, and red peppers. It was all cooked with coconut oil and seasoned with Trader Joe’s everyday seasoning and ground kosher sea salt. 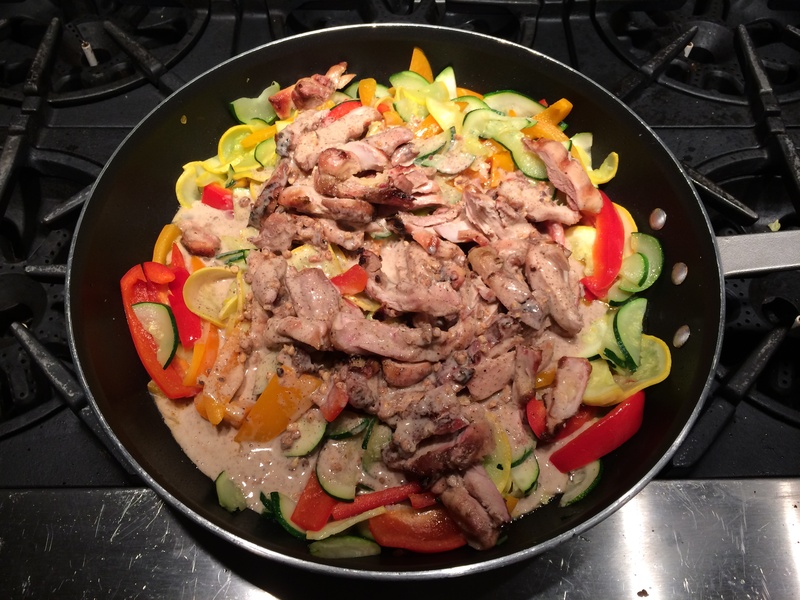 My goal with these types of meals is to over produce the most fundamental parts of the recipe so that there are leftovers in the fridge to make future meals much faster. 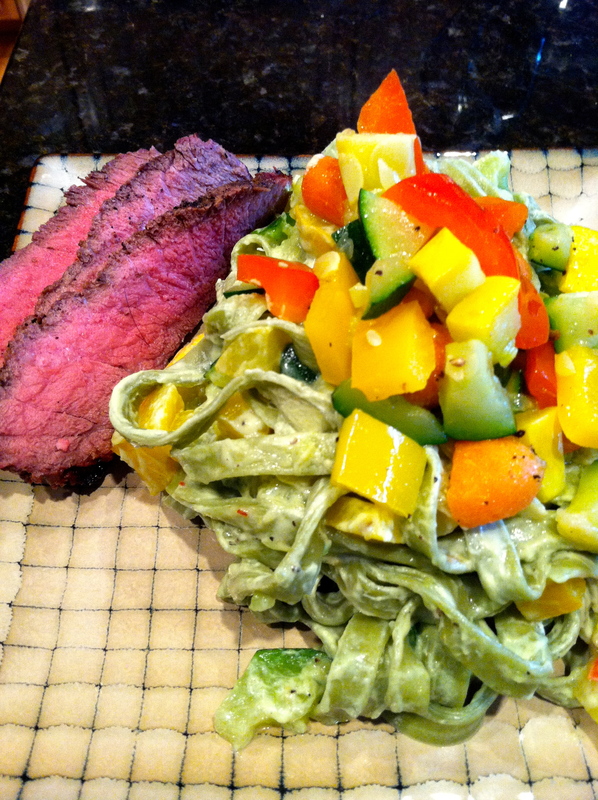 To stay true to my inspiration for this first version of the meal, I cooked more of the gluten free spinach fettuccine. Once the pasta was nice and al dente (yes, I like it a tad firm. I’m italian.) 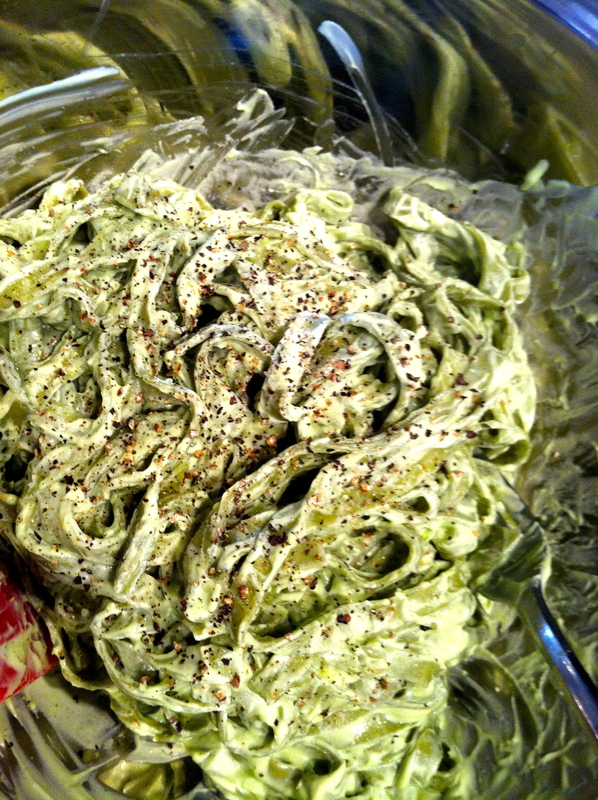 it was mixed up with the greek yogurt and avocado (2 whole avocados and 12 oz of chobani greek yogurt) and seasoned even more with ground sea salt and ground peppercorn. Add on the veggies, and voila! So, here we have our carbs for the meal (probably more than would be ‘suggested’), with our good fats in the yogurt/avocado sauce, and just need our added protein. Per my favorite grilling trends, the other side of the plate was filled with steak. This was by far my favorite meal of the week, which was a pretty safe bet since it was a blend of my two old favorites and a little bit of a comfort food ‘treat’ with the pasta and yogurt add ons to my typically dairy + grain free eating. So here’s where it gets fun: primavera veggies, day 2. First I should say that these exact leftovers, with slices of avocado for some additional good fats, did weasel it’s way into my lunch the next day. But the veggies didn’t stop there. 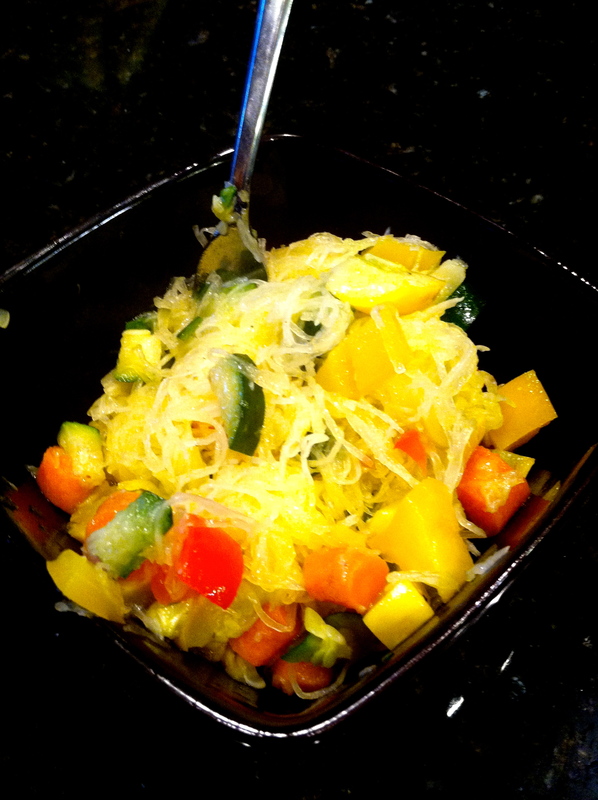 They went on to fulfill their meal destiny two nights later when I hastily roasted spaghetti squash and turned it into a yogurt-less meal of squash overload that was amazing. Of course, to accompany the squash primavera was grilled chicken and an amazing fruit and nut salad, but there will be more on that coming later this week in a full post on some of the amazing salad combinations that have been happening recently. 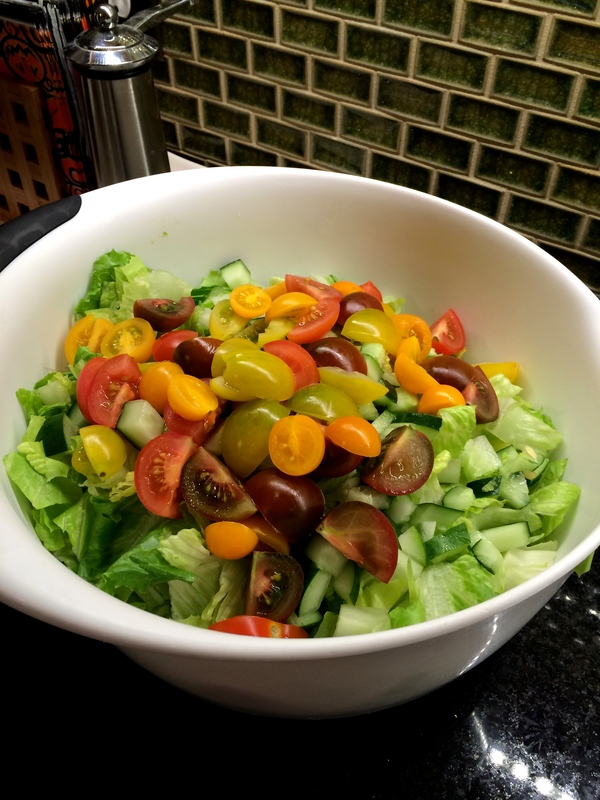 I can’t explain it scientifically, but there’s something about the warm weather that invites creativity and frequency of amazing salads as the summer meal anchor, and this one was no exception. With less kitchen time required this week, and a little too much time on (or wine in?) 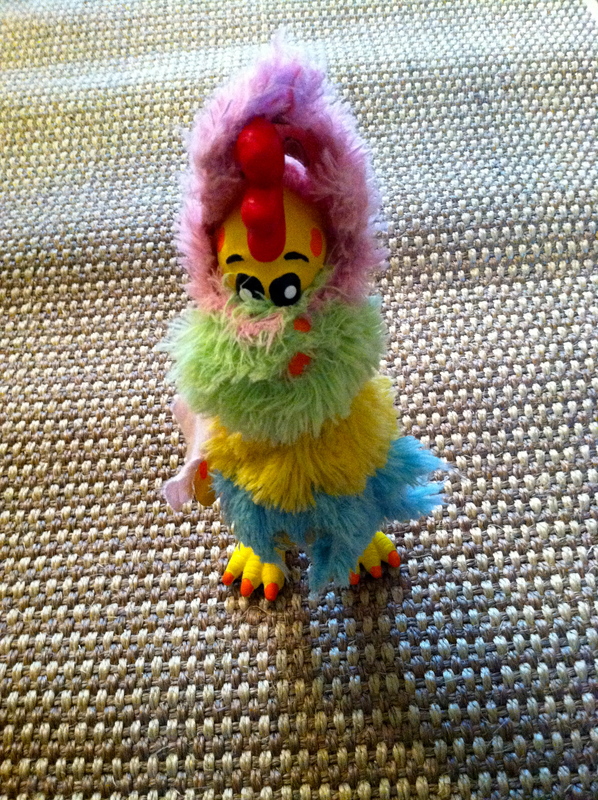 my hands, I even tried to upcycle two of Bug’s toys, covering up the chicken that she feels both active aggression and paralyzing fear towards with her old favorite buddy Cat R. Pillar. Since we don’t allow Bug to drink wine (if we can help it) she found this stunt less than amusing, and is likely working on her emancipation letter as we speak. Hope you’re all enjoying the start of the weekend!